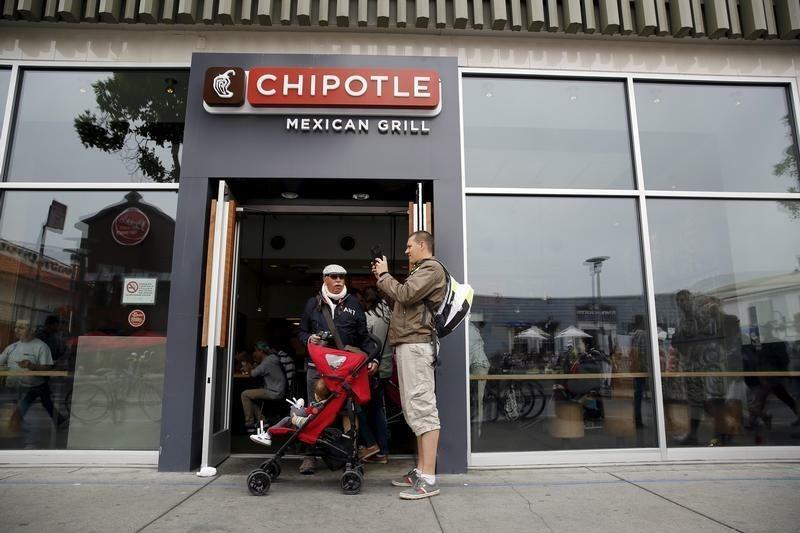 (Reuters) - Shares of Chipotle Mexican Grill Inc jumped more than 5 percent on Thursday after its founder apologized to patrons who fell ill after eating at the company's restaurants and pledged that strict new food-safety practices would prevent future outbreaks. "This was a very unfortunate incident and I'm deeply sorry that this happened, but the procedures we're putting in place today are so above industry norms that we are going to be the safest place to eat," founder and co-Chief Executive Officer Steve Ells said in an interview on NBC. As of Thursday, Boston Public Health Commission reported that 91 people had been sickened by norovirus linked to a Chipotle restaurant in Boston, in the latest wave of patrons who have fallen ill on the heels of another outbreak in the Northwestern United States. As many as 141 students had reported to Boston College Health Services with symptoms of norovirus after eating at a Chipotle restaurant last weekend, Boston College spokesman Jack Dunn said in an email. Dunn said 12 other students, who had not eaten at Chipotle, also showed symptoms of being infected by norovirus and had reported to the college's health authorities. There are no other pathogens present in the specimens tested so far and the illness on the university campus is expected to be limited to norovirus, Dunn cited the Massachusetts Department of Public Health as saying. The findings appear separate from a spate of E. coli infections in recent months that has sickened 52 people in nine states and forced the company to temporarily close some locations. Shares of Chipotle were up 4.4 percent at $572.43 in afternoon trading on Thursday. Asked on NBC's "Today" program whether Chipotle could recover financially, Ells said "certainly," a sentiment some analysts shared. "We see value in shares from current levels for investors that can look through the potential near-term choppiness," William Blair analysts wrote in a research note. The burrito restaurant chain has been under scrutiny since November, when health officials first linked it to the E. coli outbreak, the company's third food safety incident since August. The illnesses have raised concerns about potential damage to Chipotle's reputation despite the loyalty it has built over its use of fresh produce, meat raised without antibiotics and ingredients free of genetically modified organisms, or GMOs. Some critics have said the food safety concerns raise questions about the fast-growing brand, and shares of the company have fallen from a year-high in August, when the incidents began. The stock is down about 20 percent this year. Earlier this week, Chipotle's other co-CEO, Monty Moran, in a conference call with investors, blamed the media for over-reporting the illnesses. Still, on Thursday, Ells took a more apologetic tone in emphasizing its safety changes. Ells said the affected Boston restaurant would reopen after being completely sanitized and having all of its employees tested for norovirus, which is highly contagious and spreads easily through contaminated food and surfaces. Regarding the E. coli outbreak, Ells said the U.S. Food and Drug Administration has still not found an exact source for the bacteria, which can cause severe diarrhea and vomiting. He said Chipotle's new food safety procedures will put it 10 to 15 years ahead of industry standards. "We're doing a lot to rectify this and to make sure this doesn't happen again."